Lost your files? Dig them up! This is the home page of DiskDigger — an all-in-one undelete and recover utility that’s simple, straightforward, easy to use, and most importantly, free! See the FAQ for more information, or continue reading below. Current Version: 0.8.3, July 19 2009 — see what’s new in this version. Find DiskDigger useful? Consider donating! DiskDigger is also very compact and portable. The entire program is a single executable file that you can run from anywhere. There’s nothing to “install,” and the program doesn’t leave any trace of having been run. you’ve “securely wiped” your media, and want to make sure that your media has actually been wiped correctly. you’re just curious about what old deleted files are still present on your memory cards or hard drives. It’s not magic. It can’t recover any arbitrary file from any amount of time in the past. When trying to recover lost files, you should be realistic. In a real-world situation, you’ll have a good chance of recovering your files only if they were deleted very recently. The more you keep using your disk to work with new files, the slimmer your chance of recovering deleted files. Of course it’s always worth a try. It is not a “repair” utility. It cannot repair a broken memory card or disk. DiskDigger is a strictly “read-only” tool, and never changes the contents of the media you scan. It will, of course, scan unformatted (or badly formatted) media, but it won’t attempt to fix the formatting of the media. DiskDigger scans for many different types of files, including photos, videos, music files, and documents, and displays what it finds as it scans in real time. You can preview most of the files found by DiskDigger without having to save them to a different location first. More than that, you can preview files while DiskDigger continues scanning! 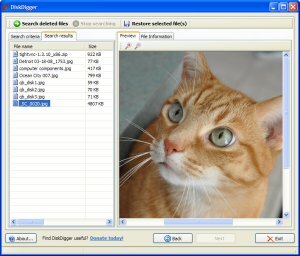 DiskDigger scans any type of media that is readable by your computer, including USB flash drives, memory cards (SD, CompactFlash, Memory Stick, etc), and your hard drive(s). It can undelete files from all types of FAT partitions (including the new exFAT file system), as well as NTFS. It can go underneath the file system to scan for traces and remnants of lost files. DiskDigger does everything in memory, meaning that it never writes any temporary files to your disk or other media (unless you choose to save files that it recovers). Since DiskDigger is a completely self-contained program, it leaves no trace on the computer where it is run. It does not save any settings to the registry. There is nothing to “install,” and the entire program is a single executable file. For advanced users, DiskDigger allows scanning disk image files. I hope that using DiskDigger should be intuitive enough for most people to use without a written guide (if it’s not, let me know how I can make it better). However, if necessary, you can check out this excellent step-by-step guide from TechRepublic. Suggestions? Comments? Questions? Send them here! Become a fan of DiskDigger on Facebook, and drop a line! – Added support for .WPD (WordPerfect) file format. – Improved error handling and saving of large files. – Improved detection of disk drives. Added logical disk drives for scanning. – Added ability to select a disk image file for scanning. – Added functionality to actually undelete files from FAT and NTFS file systems. – Updated manifest file to automatically ask for admin privileges. – Added support for Rich Text Format (RTF). – Added progress indicator when saving multiple files. – Added support for saving multiple files at a time. – Added “select all” right-click menu option. – Fewer false positives for MOV files. – Initial release to the Web.